We know that Skype uses a technology called P2P technology which enables direct IP-Based connections between the Skype users. By using P2P technology on Skype, your Computer’s public IP address is very well disclosed during Skype to Skype calls. This tech guide shows you How to Hide Your IP Address on Skype. As your IP address is visible or capture-able when you make Skype calls. 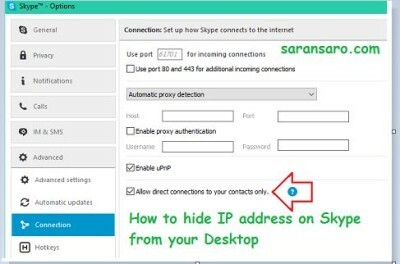 If you want to hide your IP address during Skype calls which you make to the people who are not in your contacts list, then just follow this simple trick to hide you IP address on Skype. This article shows you a simple way to hide IP address on Skype from your Desktop and hide IP address on Skype from your Skype App. This is the best way to hide your IP address on Skype from Desktop and any Skype App as well. 1. Open Skype and Click Tools >> Options. 2. Go to Advanced Settings >> Connections and tick / enable “Allow direct connections to your contacts only” check-box. 3. Click on Apply to save and take effect of changes. 2. Tap on Menu >> Settings and Scroll to “Privacy” . Just moving forward, now Skype only allows direct connections with the people who all are in the contact list. And as for non-contact users communication will be done through Microsoft Servers. 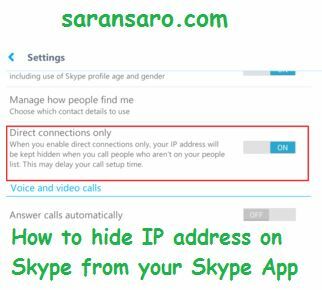 This is the simple way that How to Hide Your IP Address on Skype. Please share this article below Facebook & Twitter.